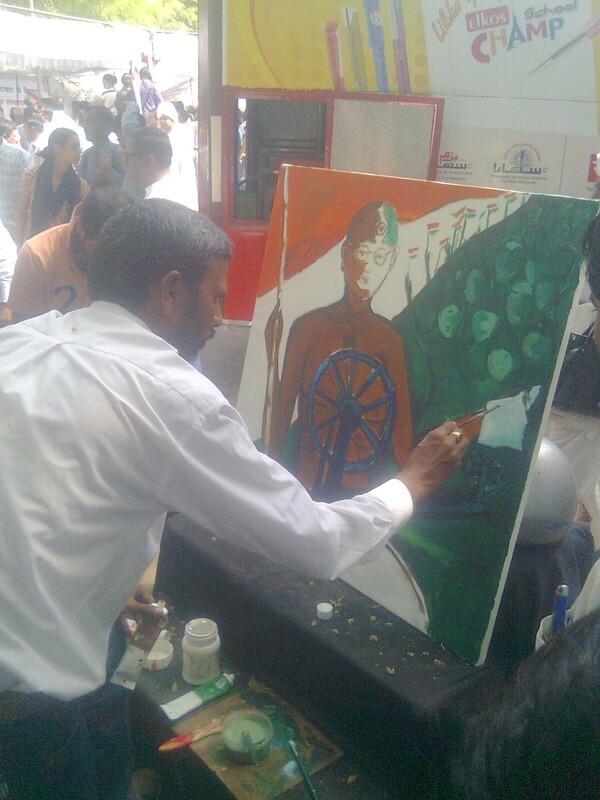 juslyktht: Anna Hazare, India Against Corruption: First Brush Stroke On The Painting In Making. Lets Take A Pledge To Complete It. A Painter, Painting At Jantar Mantar. Kick Off, Racing Start, Eruption. Acceptance of Joint Panel to draft the Jan Lokpal Bill is kick-off, racing start towards democratic awakening. We as the people of India need to carry this momentum till it's last stage, i.e. democratic empowerment and implementation. After this there are two more crucial steps needed to be taken.Number one, we as citizens of India, have to make sure that Jan Lokpal bill passes through both the houses, i.e. Lok Sabha and the Rajya Sabha. Number Two, we as citizens of India have to ensure the effective Implementation of Jan Lokpal Bill. After such large scale and high-octane awakening, we need to carry this momentum forward, till it's last stage. Then only we can afford to catch some breath. Let us all take a pledge that we will not sit-back and relax till the picture is painted luminously, and completely. Anna cleaned the canvas and inaugurated with his first stroke,now the onus lies on us to make a masterpiece.